This story of Jesus’ ascent into heaven presents us with a bit of a problem. Jesus was taken up it says. Up? Up where? How high? Are we to imagine Jesus continuing to zoom up like a rocket through the clouds, out of the earth’s orbit, past the planets, on past the stars, the galaxies, and then on to heaven? How did that work? This is difficult for us to imagine today, but it was not difficult for someone to imagine in the first century. Then, it was simple. You had the flat earth you were standing on, and the place of the dead was somewhere down below you, and heaven somewhere up above you— and probably not too high up. Do you remember the Old Testament story of the tower of Babel? Those people even thought they could reach heaven by building a tower. God got them to give up on that plan, but the very idea is an indication of how the ancient world saw the universe. The stars and the blue sky above did not represent to them a vast and infinite outer space, as we now see it. Rather, it was like a canopy, a ‘tent for the sun,’ as it says in Psalm 19:4. 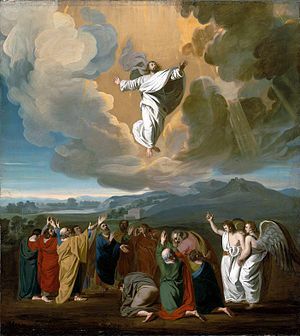 The disciples, then, would have had no problem with seeing Jesus ascend upwards into the clouds. A little bit farther, just up out of their sight, and he would simply slip through the top of the canopy and find himself in heaven; sort of like Jack climbing the beanstalk– just up past the clouds for Jack was another whole kingdom, complete with castle and giant. The ascension of Jesus is easy to understand if that is your view the universe. But now, of course, we know more about what is up there. We know, for example, that even after going up 93 million miles, Jesus would have gotten only as far as the sun, with a whole lot farther to go. We have planted in our minds far different images of heaven, earth, and sky; of what is up and what is down. And so, some Bible scholars years back began to teach that what we have in this story of the ascension of Jesus is just a myth and we need not take it very seriously at all. How can we believe in it? But that kind of casual dismissal of important Biblical texts has led to all sorts of other problems. Soon, scholars began to dismiss and discard freely anything and everything that did not appeal to anyone for any reason, and soon, for many folks, there was not much left. However, even if we do not want to go that route, the image still does present a problem for our modern understanding of the solar system and universe. After all, it is a round earth we are sitting on, and even what is up and what is down from planet earth changes to its complete opposite every 12 hours as the round earth rotates. There are better ways to speak to this problem, say some other Biblical scholars who are more inclined to respect the integrity of God’s Word and take the story as it is told. They argue that just because the disciples saw Jesus going up from them, does NOT mean we have to envision him continuing to zoom upwards and onwards at the speed of light past clouds, asteroids, planets, and stars. Let’s assume, they suggest, that the disciples really did see what they tell us they saw; and then, as Jesus vanished into the clouds, he did indeed go on to heaven– perhaps not necessarily continuing up from there, but on to heaven, wherever it is, in whatever way that happens. We do not have to be able comprehend this, for we are now, indeed, beyond the realm of scientific investigation. Jesus came to earth in the form of a person in the first place for our sake, so that we could see him. Is it unreasonable to think that he would begin his return to heaven in a way that little, earth-bound humans might see and experience? As we try to imagine the heavenly realms we are far beyond what we can see or investigate or, as Paul says, even imagine. We will not find a soul or a spirit by dissecting a dead body, and neither will we find heaven by going up high enough. The more scientists study the mind, the more elusive the spirit becomes, and the more astronomers and physicists study matter and energy and the nature of the universe, the more mysterious that all becomes. So there need not be any logistical problems here at all. We can believe this story as it is written. Jesus, it says, “was taken up before their very eyes, and a cloud hid him from their sight.” That’s simple enough. We are not told, nor do we need, any more details about how it worked after Jesus left their sight. Luke 24:50-51 — When (Jesus) had led them out to the vicinity of Bethany, he lifted up his hands and blessed them. While he was blessing them, he left them and was taken up into heaven. O Almighty God, who by thy holy apostle hast taught us to set our affection on things above: grant us so to labor in this life as ever to be mindful of our citizenship in heavenly places where our Savior Jesus Christ is gone before; to whom with thee O Father, and thee O Holy Ghost, be all honor and glory, world without end. Amen. This entry was tagged ascension. Bookmark the permalink.